I saw the trailer for Chasing Ice more than a year ago. I was immediately drawn in by how visually striking the imagery was and the innovative way in which cameras were tasked to document the remote places featured in this film. Chasing Ice documents photographer James Balog’s Extreme Ice Survey project which, with great objectivity, turns the lens on glacial recession across the far north. This is a documentary that demonstrates my first covenant of photography; you have to be passionate not only for the medium of photography but also what you turn your lens to. James Balog describes photographing ice as an experience close to that of a portraitist like Irving Pen or Richard Avedon finding infinite differences in familiar subjects. Clearly Balog maintains a fierce passion for what he does and for what this project represents. After a career spent documenting the natural world, Balog sought out a way to document environmental change that had few visual references beyond the nightly news video loop of drought, fire and the growing phenomena of extreme weather. The Extreme Ice Survey Project created a visual metric for climate change that is indisputable. Chasing Ice is really two stories, that of Balog and his team and that of the profound rate at which these glaciers are changing. My blog is about photography, and I try to keep it at that, but whatever your position on global warming, it is impossible to deny that change on a global scale is happening. Whether or not you believe that the endeavors of human kind are at fault for this change are immaterial to the fact that glaciers are receding at an unprecedented rate and all that water has to go somewhere. I believe that documentaries are portraits, they are revealing, suggestive and sometimes inspiring. 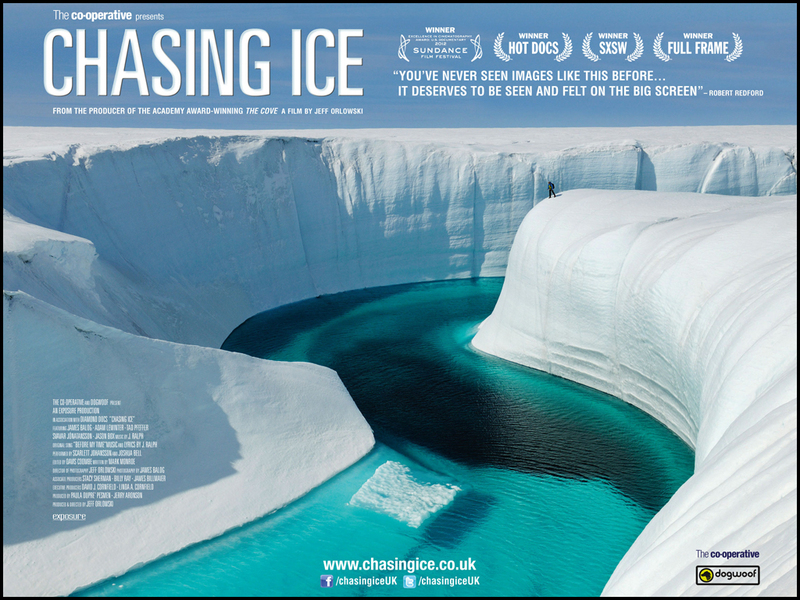 Chasing Ice is no less a portrait of Balog than it is a position on climate change. We are invited into Balog’s home, family and hospital room where he is prepped for one of a series of knee surgeries that the photographer hopes will see him through his project. For those of us with 9-5 jobs, it might be difficult to understand this kind of drive or resolve; it can appear selfish, obsessive, even insane to those of us who maintain very narrow zones of comfort. This is the nature of photography at it’s best, it takes us places that we might otherwise fear to go and it takes people like Balog and his team to take us there. Photographers take risks so that others don’t have to so we can all better understand the world we live in. Chasing Ice is available on NetFlix and on iTunes, but if it comes to a theatre near you check it out on the big screen, it’s worth it. Next PostNext Personal Work – North Shore Trail Portraits: Run Shanny Run!